photographs were presented to judges. But the '2D:4D digit ratio', and 'fingerprint ridge counts' are included in this study as well! ** PS. Last week I noticed the same conclusion from multiple other (international) studies: despite that people often assume that women have longer fingers, only the '(middle) finger length vs. palm width ratio' is higher in women. ... I have been studying the details of this study a bit more. After some thinking, I think this study provides a very interesting hypothese regarding mate-choice, and especially regarding what women prefer to see in men! The study shows that women like men to have ‘masculine hands’… however, the study als demonstrates that women do not mind at all if a man’s body (arm + face) is a little bit less masculine than his hands!! ... What is your thought? Surprizing??? I guess, we already knew that most women don't like 'bodybuilders'; this study provides a clear example of that most women are not like the woman in the photo below - instead: women usually prefer to appreciate the more 'subtile' elements in a man! Actually... these results look slightly more impressive regarding the males vs. females difference: a difference of 3.1% (compared to the 2D:4D digit ratio studies where the average is usually close to 2%). So, maybe combining this 'hand index' with the Manning's 'digit ratio'... could be an interesting combination of indices (though: contrary to the '2D:4D' the 'hand index' is NOT established before birth). Originally I created that topic created 'just for fun'... but now it becomes very useful! => People in the US appear to have the highest 'hand index' (close to 45); UK and China are less wider (close to 44); Mauritius just below that (43.8 )... and people from Japan have the narrowest hands (close to 43). In both of my hands have a relatively normal '2D:4D finger ratio'... but in both hands I have a female-like 'hand index' (the average for both of my hands appears to be close to 43). Now... what is your 'hand index'? My palm width is 3.4 inches and length is 7.1 from (first rascette to tip of middle finger). That gives me a ratio of almost 4.8. So it means either I'm an unsually weird dude or an unusually intelligent one. What are you thoughts ? Variations are only natural: a male 'hand index' of 4.8 is very well possible. It means that you have a relatively wide hand - which is a typically 'male-like' characteristic. Sorry, if there is any connection between 'hand index' and intelligence... I have various reasons to assume that a 'narrow hand' could more likely indicate a high (verbal) intelligence. 1 - Down syndrome & fragile-X syndrome which are the 2 most common causes for a low intelligence is usually featured with a relatively wide palm, which implicates a high 'hand index'. Thanks for this reply Martin. Will read through the link you've given. Now I know what I've suspected all along. It's my brain that's the problem. A followup question: For the width, I took the measurement from the crease where the thumb joins the palm to the opposite edge of the palm (Moon mount edge). I drew an imaginary line between these two points parallel to the rascettes and measured that dimension. sgm2010 wrote: A followup question: For the width, I took the measurement from the crease where the thumb joins the palm to the opposite edge of the palm (Moon mount edge). I drew an imaginary line between these two points parallel to the rascettes and measured that dimension. Your follow-up question is essential! 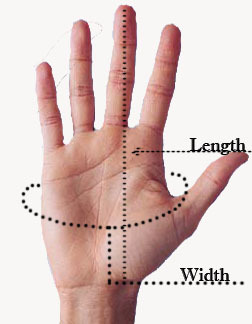 Sounds like you have not used the correct method in your first effort, so I can only advice to measure your 'hand width' (you can take the average of both hands) as described by the picture below. 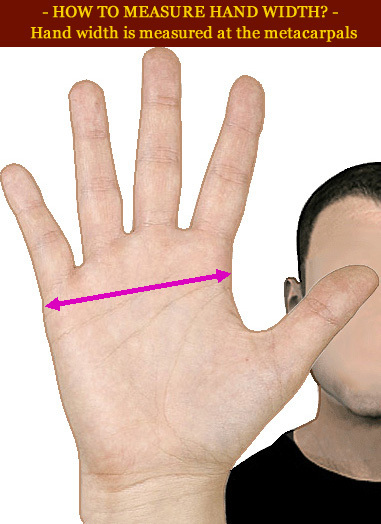 NOTICE: As far as I know in all scientific studies 'hand width' is measured at the metacarpals just below the fingers (you should strive for finding the smallest palm width in that particular palmar zone). I did take a fresh measurement as shown in the diagram. The width is aprrox. bet. 3.1 and 3.2. So that's makes my hand index about 4.36 - 4.5. Probably average ? Okay, thanks for your feedback... and it Iooks like my picture became helpful for you to make a more precise measurement. Great! ... I wonder what will become visible when 'hand index' is mapped in a chart against 'finger length index' (as defined in the chart below)??? The answer is simple: the result sort of looks the same as in the chart above (with changed position for the axes). 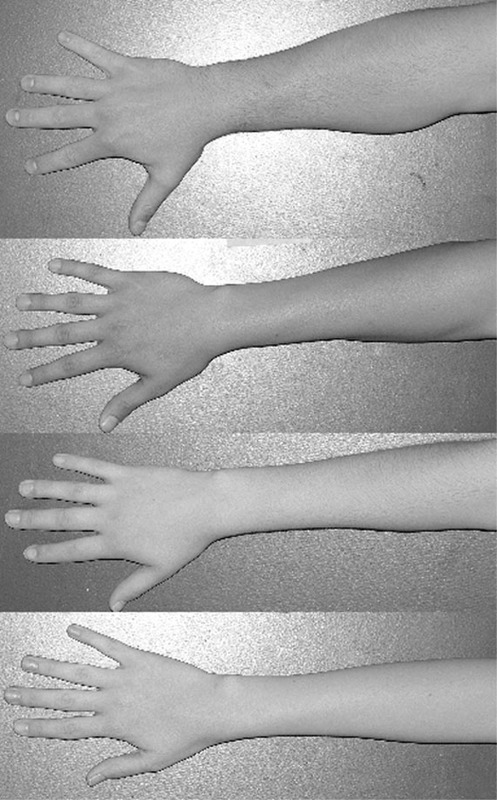 By the way, for recognizing gender via 'hand index' or 'finger length index' the results are similar (and my picture shows that combining both indices does produce a slightly better result, but the Japanese male sample continues to be positioned close to the female average of all 6 populations). But it looks like combining the '2D:4D digit ratio' with the 'finger length index' produces a formula which is highly discriminating measure for gender in individuals.... because then all 6 male populations would have lower (average) scores for the 'finger length index + 2D:4D digit ratio' measure than the 6 female populations! However, I would like to invite you to add your '2d:4d digit ratio' on top of your 'finger length index' value (= fl/(pb+pl)... and I expect that you hand then clearly belongs to the female category. EDIT: PS. Combining the 'hand index' with '2d:4d digit ratio' would require to distract both measures (because the 'hand index' gets larger for smaller 'finger length index' values)... so one can not replace the 'hand index' for the 'finger length index' in the formula which I described in my former post. No. How do you 'combine' the 2D:4D? Patti, you can do that by simply summarizing your 'finger length index' with your 2D:4D digit ratio (for your left hand: digit ratio is close to 0.97, 'finger length index' is close to 0.43, combined the result is: 1.40 - which is at the borderline between masculine hand-finger shape and femine hand-finger shape). I think this application for combining hand shape with digit ratio could become a very interesting topic... with potential practical purposes (for example as a measure for the 'masculinity' factor, because both the hand shape and finger length ratio do not represent a reliable measure in isolation). I will see if I can present a picture with all necessary guidelines. Thanks! It's interesting to think about my hand having masculine ratios. In high school I was placed in advanced science and math classes which are more male dominated, especially the time period I attended school. Later in other tests related to entrance to the military, I scored highest scores to that date in the unit I was in and I was their first female. Same time period I played competitive chess at cafes. Yet emotionally and in appearance I'm very obviously feminine. Hi Patti, thanks for sharing that. Interesting! By the way, regarding the '1.40 borderline' that I mentioned... I have done some further study and found that the borderline for the combined measure (digit ratio + finger length index) should be estimated at 1.385 (because the six international populations that I have studied so far show that all average scores are for the males are 1.381 or lower, and for the females 1.389 or higher - for US females I found an average score of 1.408 and for US males score is 1.374). So, this implicates that in this combined measure your score is on the feminine side. (I have tried to find hand anthropometry data for populations from other countries than China, Japan, India, Turkey, UK and the US; I only found useful data for people from Malaysia... which confirms that the 1.385 might work well. Interestingly, the Malaysian data also indicated that the 'hand index' is far above 0.44 for Malasian men and women - and I found another study for Malasian elderly which confirmed that. So, it looks like the combination of the 'finger length index' + '2D:4D digit ratio' is a more accurate discriminator that the combi 'hand index' + '2D:4D digit ratio'.